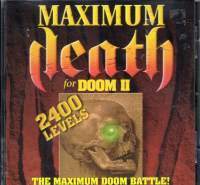 This is a collection of 2400 new levels for Doom II. The CD is completely menu driven. This menu allows the level to start individually and be modified. New weapons, textures and monsters are also included. It includes skill levels, on/off monsters, respawn monsters, many special effects including sounds, graphical addons and gun modifications. Play Doom by modem with a friend or use DWANGO directly from the interface. Also included is an international directory of other DOOM'ers that are looking for some good competition. All levels are categorized as registered levels, deathmatch, top rated and single levels. All levels can be stacked together or played separately without going back to the menu. In addition, on the CD is the "DeeP" Level Editor.